Hooray to yet another parcel of goodie arriving in my mailbox today. And this time, its from Brands Wellness Singapore. It’s Brand’s Sesamin With Schisandra Extract 5 Days Trial Pack that I had redeemed for myself quite some time ago. Being the largest organ, the liver plays a vital role as your body’s filter by detoxifying your blood. We all know how important is it to keep our liver healthy. However, our modern living lifestyle does not enable us to do so. Stress, lack of sleep and poor eating habits are some of the ways that will damage our liver, leading to exhaustion and poor skin conditions. Am so looking forward to a more healthy me from now. And if you shall be interested in getting some samples too, please click HERE. I don’t think I need to say anymore things. This is such a piece of good news. Especially to book lovers like me. Now grabbed the biggest backpack or perhaps a luggage bag for the extremes, and rush your way down to Kino and start clearing their book shelves. I’ll be there too. Today had been a very lazy day for me. I practically slept through my whole morning and afternoon. Slept at 12 midnight yesterday and work up at almost1pm today. Had my brunch before doing some handicrafts. Dozed off at about 3pm and wake up again at about 4.30pm to catch a glimpse of the drama that dad is watching. Went back to ZZzzz land and wake up at almost 7pm, just in time for dinner. But sarcastically, the more slept, the more tired I feel. I’m very luck to be able to spot the actual magazine ads insert of Confirm Trading quite some time ago. And for that, I’ve managed to get for myself Kinohimitsu Beauty Drinks Trial Set. The lovely parcel containing my goodies arriving safely in my mailbox. I love receiving mails. Aren’t they such lovely babes to you? A million thanks to Confirm Trading for giving me a chance to try out such lovely products. And there they are, inside my fridge, along with my other health and beauty drinks. By the look of the empty space available, I think its time for me to top up my supplies at Watsons soon. Hooray to Mr postman! Hooray to more new mails for me! Because it simply means more new goodies for me to play with. And it kinda make me excited. I mean who isn’t? Especially when it free too. My new goodies, all freshly out from the various parcels. Aren’t they such lovely babes? I’ll include the link for the various items should you wish to get them for yourself too. I happily registered myself and 3 other friends for the Shu Uemura party, hoping to learn some makeup skills and also to find out more about the various products available. And yet it had to become the most fatal mistake that I had ever made. 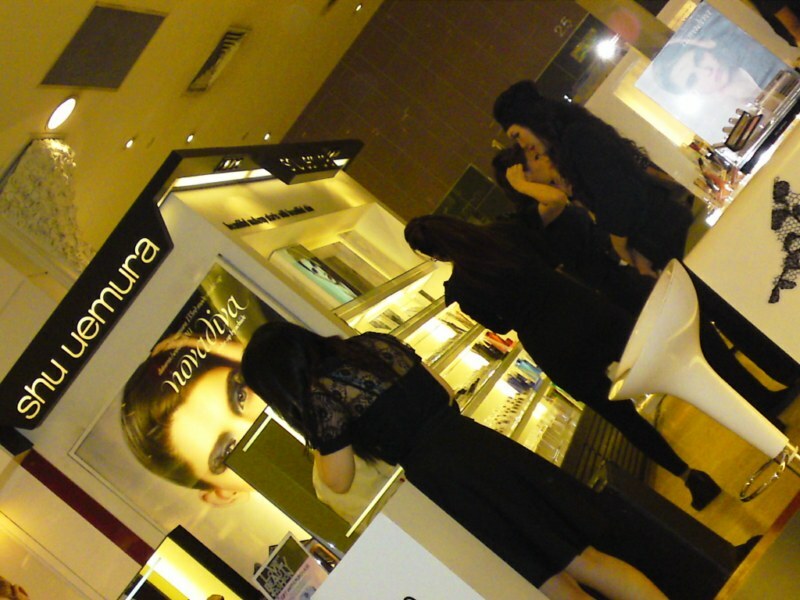 I’ve been to a few similar events organised by Shu Uemura at their other outlets. But sadly, none of them is as disappointing as today. Firstly, no one was around to attend to me when my friends and I arrived. It seems like everyone is busy with their own , only they know things. The event was suppose to start at 6pm. But despite waiting till 6.20pm, nobody bothers to update me on what is happening. I have to go ask the staff myself. And when the party finally starts at 6.35pm, there were only about 6 persons around- My 3 friends and myself, and also 2 other people whom I believed to be friends or regular customer of the staff . Because the staffs were too busy talking with them to realise my needs. Despite standing in front, I had difficulty taking a closer look at the demonstration. Why? Because the other staffs stood there like “Raffles’ blocking my view. After a while, I simply give up and sit down on the chair just in front of their counter. I was like: ‘eh! so who is the audience right now? your own staff or those who had rsvp for the party like me?’. The whole demonstration of both day and night makeup took about 25mins to finish on both models. And after that, the staffs simply went back to doing their own business again. And nobody bothers to check with us if we were interested in trying out any of the various products available. And the so called refreshment is only cream puff and some diluted sugary drinks. Hooray to book sales! Am so going to check out the titles available and top up my book collections.